Over the past 30-40 years, the Pacific surf town of Playa Tamarindo has attracted and been a rendezvous point for many travelers, backpackers and nomads from around the world. Despite having only one road in and out of the small town, it has not stopped the magnitude of visitors it hosts each year, supporting the theory that if you’re traveling in Costa Rica, "all roads will eventually lead to Tamarindo". With its sun kissed beaches, consistent swells, and surfer bohemian vibe, Tamarindo captures the essence of the Tico's expression "Pura Vida", meaning "Pure Life". After spending some time in the Surfing Utopia, it is easy to understand how you could extend your stay from days to weeks, months and even years, with many foreigners now calling the sandy beaches their home. Since the first surfers arrived in the early 1970s, word spread and gradually attracted more and more part time and full time visitors, earning it's nickname, "Tama-Gringo". To the disappointment of some, naturally the appeal of the destination is no longer a "best kept secret" . Whilst some may say that "Tamarindo has been overrun with foreigners", my exposure to the culture did not support these statements as being a negative experience. The complete opposite in fact. In an average day, I interacted with our Costa Rican hosts over a traditional breakfast, discussed Costa Rican coffee with the Italian Cafe owner, got lessons from our Venezuelan surfing instructor and later grabbed lunch at an Israeli Falafel bar. Each of these different walks of life, are all connected and brought to the small town by their common draw of the beauty, lifestyle and culture in the area. Rather than saying Tamarindo is another fallen victim to the tourist trade, it plays host to an eclectic variety of cultures who all adopt the love of Costa Rican culture in some form or another. From my experiences in conversing with the Costa Rican people, the tourism trade is simply another industry used to help benefit the economy, and they have been able to successfully reap the benefits of this without losing their cultural identity. On my many outings through Tamarindo, I photographed a glimpse of the sights, smells and culture of the vibrant town. As I wondered down to the beach, I was greeted with truckloads of fresh tropical fruit, backed by beach shacks and lounge bars. The beach is vibrant with passing surfboards, vendedores, niños playing football, and the constant trail of fishermen heading back and forth with catches of fish. It was interesting to observe, like clockwork, during the last hour before sunset, travelers and even the locals would all make time to be on the beach as the golden sun would quickly drop into the pacific. Being a true believer of diving head first into cultural experiences, Tamarindo has plenty of authentic experiences, unique to the region, should you wish to pursue them. 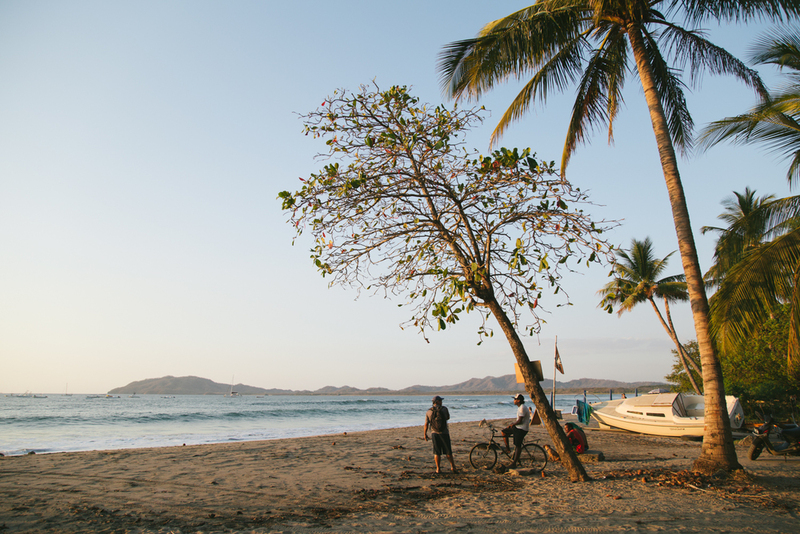 If you simply engage with both the local and adopted Ticos of Tamarindo, hearing their stories of how they came to be here, you will be hard pressed not to raise a cold glass of imperial and shout "Pura Vida!"